A single Steele pillow lists one of the slabs as William Steele II. A single Steele pillow lists one of the slabs as Peggy Ann Steele. A single Steele pillow lists one of the slabs as Kattie Steele. A single Steele pillow lists one of the slabs as Des De Verne Steele. Birth year may be 1900 - difficult to read. No 'r' in last name, but last name probably Yarbrough. Birth and death years difficult to read. Only middle initial appears on stone. Name per indexers. Grave begins a new lot. On same headstone as Louise L. Webb. A headstone shared with Rev. Eugene G. Webb has birth year 1908 and no death date. On same headstone as Louie Allen. On same headstone as Evangelina B. Allen. Service headstone lying on slab. Grave begins a new family lot. "Loving Husband". At foot of slab: "Beloved Children and Grandchildren". Maiden name spelled with "oo" but it probably should be "Calhoun". Plaque inset on headstone indicating Life membership in Int'l Union of Bricklayers & Allied Craftsmen and a 50-year member. In a separate lot by itself. In same lot with Elbonee Cheathem. On same headstone as Ida M. Holsey. On same headstone with James J. Holsey, Sr.
All info per Peoples' Funeral Home marker. "Wife & Aunt Bessie Sanford"
On same headstone as William Sanford, Sr.
On same headstone as Bessie P. Sanford. "Mom" On same headstone as Eddie Lee Boyer. "Dad" On same headstone as Ida B. Boyer. Last name questionable - difficult to read. "Sam" "You gave us your love, your smile, your kindness. We will remember you always, with love. t, Wife and family"
On same headstone as Rosa Mae Davis. On same headstone as Carl Lee Baker. "Father" On same headstone as Mamie A. Davis. "Mother" On same headstone as Nathan Davis. "Mother, we loved you, but God loved you best. - your devoted children". No birth year on marker. "We loved you but God loved you best." MD. "Death is only a horizon"
"She died as she lived, a Christian"
"She died as she lived - a Christian"
Graves 2 through 5 are within a walled area. On lot coping: Not my will but thine be done. Death month illegible. Child-sized grave. Last name possibly should be spelled "Evans"
On lot coping: Not my will but thine be done. No dates recorded on slab. Adult-sized slab. Last name spelled with a 'y' but possibly it should be spelled "Hurt". Birth year is illegible. Child-sized slab. On same headstone with Harper Myrick and Priscilla Myrick. On same headstone with Hattie Myrick and Priscilla Myrick. On same headstone with Hattie Myrick and Harper Myrick. Dates are difficult to read. No death day on stone. Family name on lot coping is "Jarrette". Family name on coping is Jarrette. We Will Meet Again. The only date on marker is presumed to be death year. Adult-sized slab. Possible graves in row west of other graves in this lot. Georgia PVT Co B 548 Engineers. Devoted Husband, Father, Son, Brother. At Rest. Masonic emblem on grave. Enclosed in coping along with grave of Mamie Willis. 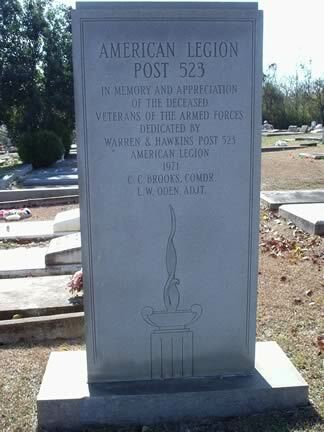 Enclosed in coping along with grave of Willie E. Willis. Possible grave: depression in ground. At Rest. Order of Eastern Star emblem on grave. No birth date recorded on slab. Adult-sized slab. No day of birth was recorded on slab. Lived only a short time but was greatly loved. Gone too soon. 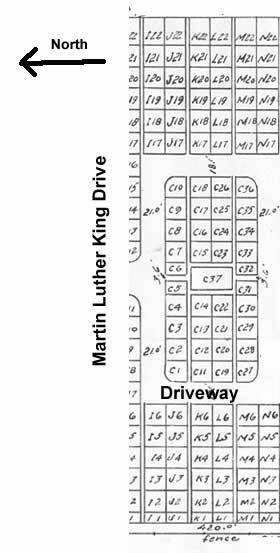 One or more unmarked graves possible. At Rest. First name spelled as "Mennie". Name possibly a misspelled version of "Carolyn". A Loving Brother. This grave and those of Anna Slater and Henrietta B. Lunsford are enclosed in stone coping. Our Loving Mother. This grave and those of James R. Ingram and Henrietta B. Lunsford are enclosed in stone coping. A Tender Mother and a Faithful Friend. This grave and those of James R. Ingram and Anna Slater are enclosed in stone coping. Last digit of birth year difficult to read.